1. Begin by adhering a sheet from your Simply Creative Folk Song 12x12 paper pad to your piece of grey board, with double sided tape. Cut off the excess paper around your board. 2. Next, cut two 6cm wide strips of coordinating Folk Song paper. Place your vertical strip on the desk, with the design facing down. From the top, measure 3cm down and using a craft knife, cut an 8mm x 1cm tab ensuring to not cut the bottom edge. 3. Repeat this 4 times down your strip, measuring 3cm between each tab. Once complete adhere your strip to the centre of a 6.5cm wide strip of complementing Folk Song paper using Dovecraft Perma Fix tape. TIP: You can add more tabs to your strip but we have only done four tabs per strip so the dies fit on the length of the board. 4. Repeat step 2 & 3 on your second 6cm wide strip. 5. Stick your two strips to the greyboard, ensuring to leave a 2.5cm gap on the right hand side and left hand side. 6. Die cut a selection of Dovecraft flowers, butterflies and buttons dies onto the same sheet used for the backing paper on your greyboard. Decorate the border of your board with these die cuts, using 3D foam pads to create dimension. 7. Punch a hole on the top left and right corner of your grey board. Thread through a length of string and tie a knot on both ends. 8. Now your Dovecraft Dies are ready to hang on your board! 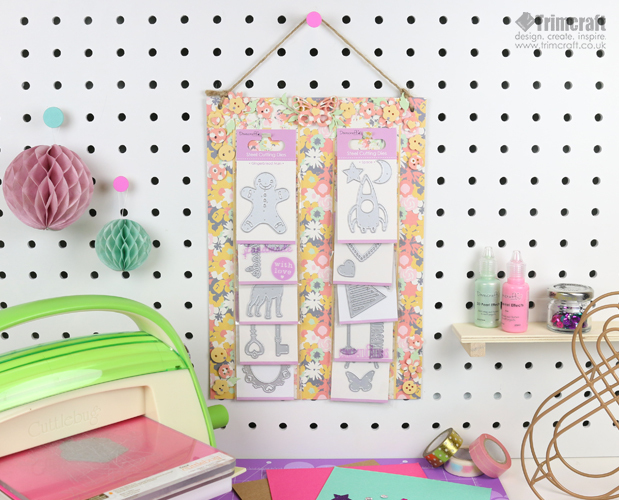 This handy storage will make a wonderful addition to your craft room and with our selection of papers on offer, we are sure you will find the perfect design to match your home décor! We would love to see your Dovecraft Dies Storage projects, make sure to upload them to the inspiration area and to #Trimcraft when uploading to social media.